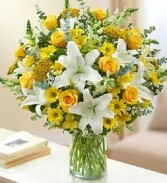 Stunning, beautiful flowers, sure to guarantee a WOW from your beloved, spouse, best friend.... Elegant designs created with premium chocolates, roses, lilies, orchids, and premium garden flowers, sure to impress. 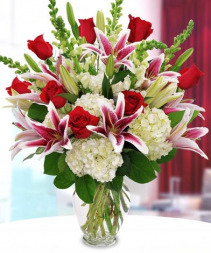 Everyone is impressed by this magnificent gathering of premium blooms including Oriental lilies, Gerbera daisies, Delphinium, Matthiola, and more. 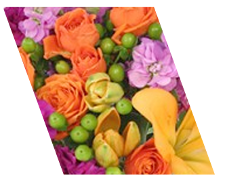 As in an estate garden, the primary blooms are large and impressive with a rich combination of colors in pinks, orange, golden yellow, and blue. With seasonal variation, expect substitutions like Matthiola in the spring (as shown) changing to Snapdragons (Antirrhinum) in the summer, Liatris in Fall, and berried branches in winter. This one is always a favorite. Large Gerberas Mixed Orange & Yellow, Starfighter Or Similar Pink Lily, Stock Any Color, Delphinium, Larkspur Or Snapdragons Or Liatris, Canterbury Bells Or Lisianthus Pink Or Lav, Orange Roses, Blush Roses, Dark Pink Roses, Bicolor Roses, Agapanthus Or Small Blue Hydrangea, Solidago, Myrtle, Salal. 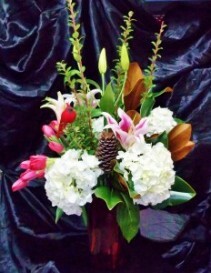 Snapdragons, White Hydrangea, Stargazer Lilies, Red Roses, Salal. 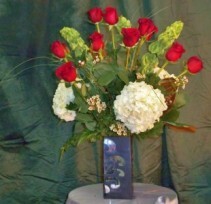 Long Stemmed Color Roses, Assorted Foliage, Lead Crystal Vase. 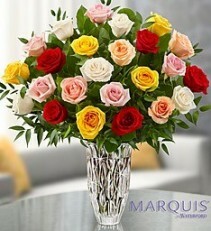 24 Long stemmed color roses, hand selected for their beauty, and arranged in a fine crystal vase. The Lead Crystal Vase has been hand cut and polished in the world renowned tradition of the artisans at Waterford in Ireland. A gleaming treasure for someone who is treasured. Red Roses, Pink Roses, Tall Clear Vase, Salal, Babys Breath, Other Greenery As Needed For Interior Of Design Mostly Flowers Showing. Blue skies, warm sunshine, vibrant colors. 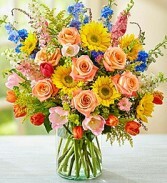 Summer is a time to stop and enjoy all the beauty around you—and this gorgeous bouquet is no exception! Featuring a soothing mix of pink, blue, yellow and peach blooms artistically hand-designed by our skilled florists, this luxurious arrangement delivers the best part of the season right to their door. Some substitutions may be necessary but will be equal or greater in value. Red Roses, White Hydrangea, White Wax Flower, Bells Of Ireland Or African Boxwood, Magnolia, Leatherleaf, Salal. Perfect remembrance bouquet, a dozen beautiful long stemmed red roses with gorgeous white hydrangea and fragrant wax flower. Bells of Ireland and other distinctive foliage are presented in a modern black and silver container. Prange's original design. 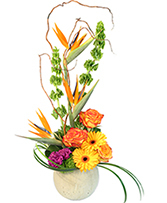 Birds Of Paradise, Dendrobium Orchids, Tropical Foliage, Salal Or Pittosporum To Fill In, Solidago, Seeded Or Silver Dollar Eucalyptus. 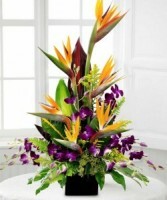 Birds of Paradise and Dendrobium orchids paint a beautiful picture against a backdrop of tropical and temperate foliage. A truly "WOW" design. 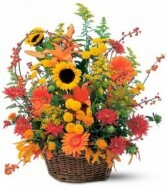 Call Prange's today at 352-335-0100 to make someone's day with flowers! 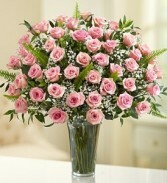 Your gift becomes a spectacular event with this heartfelt expression of your care via premium long-stem pink roses. 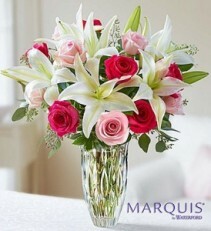 Perfect for your true love, new love, or best friend, or new mom. 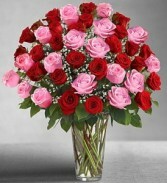 36 or 48 Stunning pink roses...unforgettable. Monet Or Similar Large Vase Tall For, Cm Roses, B Babys Breath, Italian Ruscus, Swordboston Fern, Tree Fern, Salal As Necessary. 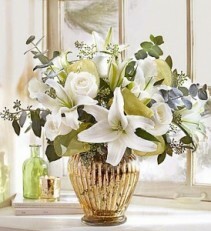 White Roses, White Lilies, Baby Blue Eucalyptus, Seeded Eucalyptus, Sheer Gold Ribbon, Bronzecopper Vase. 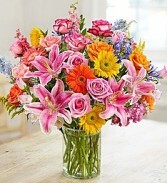 Bright and beautiful, cheering and soothing. A gathering of striking white roses and white Oriental lilies with the cool tones of eucalyptus is paired with our trendy fluted gilded vase. 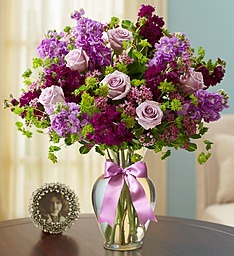 The result is a sophisticated, dramatic gift that will infuse true elegance into their home—or yours. 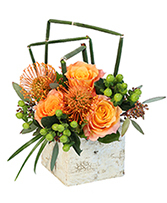 Heliconia, Ginger, Dendrobium Bombay Orchids, Pincushion Or Other Protea, Green Trachelium, Tropical Foliage Bunches, Cube Rectangle. In much the same way a world-renowned painter blends the gentle strokes of a brush to create a wondrous array of color,the artist has blended vivid heliconia or strelitzia, ginger, dendrobium orchids, dianthus and protea in a distinctive container. The resulting masterpiece provides a gift of perfection for special occasions, for everyday, or just because. 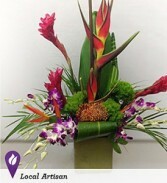 Tropical blooms may vary in color or size, but the overall effect and value are maintained. 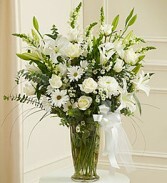 Or White Roses, Mixed Foliage Including Italian Ruscus. 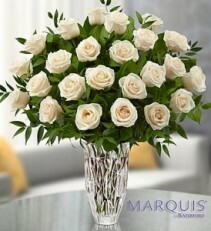 Send an expression they'll never forget with our striking bouquet of premium long-stem white roses, beautifully hand-arranged in a keepsake Marquis by Waterford® crystal vase. 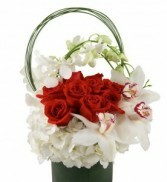 An elegant thoughtful gift to send. 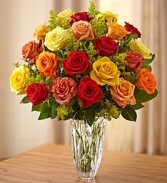 Cm Freedom Roses, Cm Freedom Roses, Italian Ruscus, Variegated Pittosporum, Urn Vase. Prange's Exclusive!!! 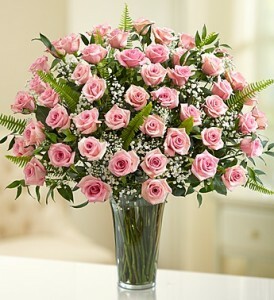 A stunning designer display of 100 premium long stemmed Freedom roses Melt their heart with this exquisite gift of passion. Light the fires with this WOW!!! 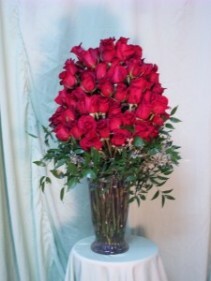 arrangement of one hundred of the finest hand selected long stem ruby roses with rich foliage specially prepared and arranged in a special ribbed vase. Again...WOW!!! Gold Vase, Red Rose, Mini Carnation Burgundy, Hot Pink Rose, Dianthus Purplecarnation Purple, Stock Purple, Ti Leaf Red, Salal Tips. A beautiful celebration of color! 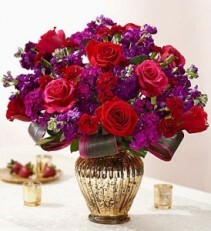 This vibrant and luxurious bouquet with rich red and hot pink roses, burgundy mini carnations, purple dianthus and more is nestled into a luxurious copper urn vase. Just one look will bring a bright smile to someone’s face! Original design by Vivian Chang, Conroy's, Los Angeles, CA.